The 21st Century Housewife: "Was Jerusalem Builded Here?" We spent last weekend with our friends in the Buckinghamshire countryside. It was wonderful having the chance to walk in such beautiful surroundings. 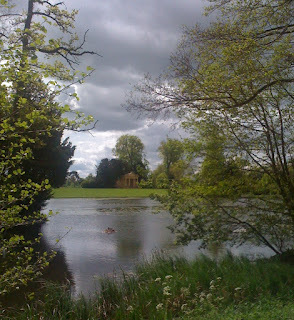 One of the places our friends took us was Stowe Gardens and it was amazing. There are miles of walks, beautiful trees, plants and flowers, a gorgeous lake and follies everywhere. From stunning bridges, to miniature temples and statue gardens, this place was clearly a playground for its owners and their guests. I was reminded by this how very beautiful England is. Despite the relentless march of progress, parts of the “green and pleasant land” William Blake referred to in his short poem prefacing his epic “Milton: a poem” still exists today. That short poem was the basis for “Jerusalem” the iconic hymn by Sir Hubert Parry. There is a story that sits alongside, but is not a part of, acknowledged scripture. In this story, Joseph of Arimathea is more than the man who gave his own tomb for the burial of Jesus after he was crucified, he is Jesus’ uncle. It is said in this story that when he was a boy Jesus travelled with him to what is now England. The poem Blake wrote implies that if Jesus visited here, a second Jerusalem (like the “New Jerusalem” referred to in the Book of Revelations) must briefly have been created, a foretaste of paradise. This was a stark contrast to the “dark satanic mills” (factories where people worked in horrid and dangerous conditions during the industrial revolution) that scarred the landscape in Blake’s time. However unlikely the idea of Jesus visiting England centuries ago is - England was a very long walk indeed from the Holy Land - ironically, today Jerusalem is a more appropriate hymn for this country than ever. Although we may no longer have the worst of the “dark satanic mills” of the industrial revolution , today we have metaphorical ones. They are the cracks appearing in our society - the terrible things we hear about on the news, the loss of part of a generation to crime and drugs and the disintegration of family values - England is threatened on many sides. However, visiting places like we did last weekend reminds me that the best of the England of the past - the beauty, indomitable spirit and old fashioned values - still exists in places. It is not just in the the beautiful countryside either. It’s in the hearts and minds of those who remember it, in the spirits of those who have gone before us, and it definitely lives in those of us who are determined that, despite some of the setbacks we have had, one day Britain will be Great again.